We're very pleased you could drop by our Patreon! Everybody Edits is a free 2D online multiplayer sandbox level-building game with a greatly creative community producing a huge range of fun and engaging worlds, along with artistic flair and style! Players can edit levels themselves, or build collaborations with friends... or everybody! So why have we started a Patreon? Well, we're working on a brand new version of Everybody Edits! It's currently playable in Flash, but we want to bring the game up-to-date by launching a version called Everybody Edits Universe in HTML5! In order to do this though, we need various funding in order to pay for domains, servers, staff, equipment, and advertising. We want to be able to grow the game and its community so we can have even more fun with more people creating quality levels! We really want to build up enough funding to increase our advertising budgets to such an extent that we're able to save up to go to Gamescom in Germany! We can show off and demonstrate Everybody Edits to thousands of people in person, aiming to enhance our community to be greater than ever! Thank you for taking the time to visit, and we'd love to see you in-game! Become part of the official Everybody Edits Discord community and receive early teasers to upcoming content! We'll also hold some giveaways! Enjoy all the benefits of Gold Membership in Everybody Edits for as long as you support this tier! You also receive guaranteed Closed Beta access for Everybody Edits Universe, and permanent Beta Membership in the current version! In addition, if you already have Gold Membership, you get the equivalent in gems to however much you have remaining on your account! Usually delivered within 24 hours. To show our gratitude, you get to show off in Everybody Edits with this special username color for as long as you support this tier! Limited Edition Animated Big Spender! A special exclusive animated silvery/platinum version of the Big Spender is yours in Everybody Edits for as long as you support this tier! It's the only animated smiley in the game, so you'll really be part of a truly exclusive club! If you don't already own the current Big Spender, you'll receive that permanently as well! Everybody Edits Universe Alpha Access! We're very grateful to anyone able to support us to this extent, so we feel it's only right and proper that you're able to join us on our journey throughout the development process! After signing up to this tier, I'll get in contact with you directly to arrange signing of a Non-Disclosure Agreement. For legal reasons, you must be aged 18+ to sign this contract. Following the contract signing, you'll be invited to the very exclusive Everybody Edits Universe Alpha Discord, and be updated on everything the staff knows about planned updates to the current version of Everybody Edits, as well as all of our plans for the reboot and the future of the game! We'd also love to hear your feedback, and there's no better way to be informed of everything that's going on behind-the-scenes! You also get direct access to the Alpha testing stage currently planned for November-December 2018. Usually delivered within 72 hours. Address required for NDA signing. From August 2020 onwards, we plan on attending Gamescom in Germany annually to promote the game! Gamescom is Europe's largest video games trade fair held annually every August for 5 days at which approximately 345,000 people attend! As a previous organizer and attendee of a booth at Gamecom for Square Enix Europe, I can say with confidence that I can arrange for Everybody Edits (the reboot) to go to Gamescom! Travel to Germany from (almost) anywhere in the world! Be put up in a hotel for the full duration of the event! Receive an Exhibitor/Trade Pass for Gamescom! Help demonstrate the Everybody Edits Reboot with us! We would be very excited to meet up with you and hang out, and we hope you can join us on this adventure! Requires at least 3 months of support. Must meet the $3000/month community goal. As many of you are aware, our staff currently puts huge amounts of time in to producing Everybody Edits voluntarily for little to no monetary compensation. 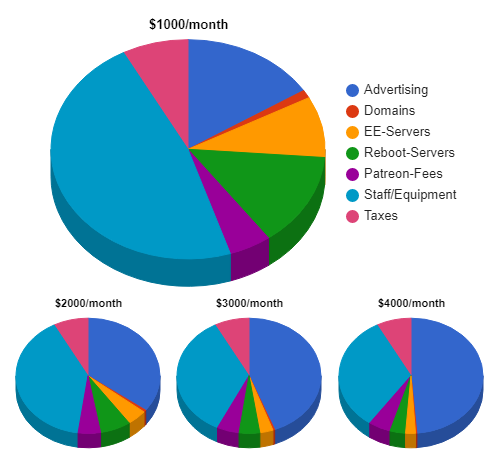 By reaching $1000/month, this means we can pay some freelance part-time wages! As a result, this money will also go into allowing our staff to spend even more time on the game, and help us upgrade our equipment and software to make it easier to deliver quality content! When we reach this goal, I'll be doubling the number of Patron-exclusive update vlogs each month!